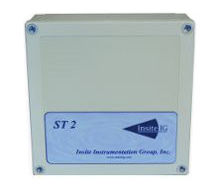 The Insite Instrumentation Group Sensor Transmitter (ST 2) will wirelessly connect any 20 Series sensor with the Process Transmitter (PT 2). 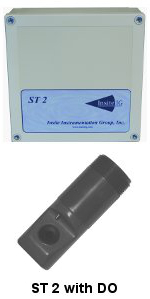 Compatible sensors include DO, SS, pH, and ORP sensors. The 20 Series system allows for flexible and economical process monitoring and control. The ST 2 has an outdoor line of sight range of up to 1500 feet. If the PT 2 is mounted indoors, the closest ST 2 should be within 600 feet. 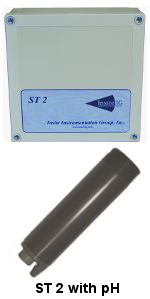 The ST 2 links together with other ST 2’s and the host PT 2 to form a ZigBee compliant RF network with self-healing mesh technology ensuring trouble-free communications. This significantly reduces installation costs as the there is no need for interconnecting cable or conduit. 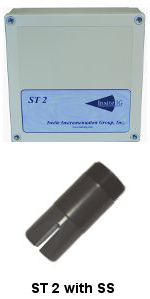 The ST 2 has a DC power on/off switch to allow for safe connect/disconnect of any 20 Series sensor. A rotary switch allows you to choose from 15 different PT 2 ID's. Another rotary switch is used to set the Sensor Address of the ST 2 so that it can be identified within the network. 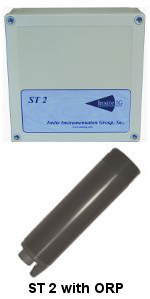 The ST 2 has two isolated 4 to 20 milliamp outputs that can be spanned to any range within a specific sensors measuring range. There is one set point relay that can be used as a switch or as an alarm. Another relay is dedicated to controlling the self-cleaning of the sensor.